The bureaucrats – who I am sure were well-meaning, nice people –thought it was a great idea. The residents will share kitchens! This would be nice, they could cook together, have meals together and wouldn’t that be a good thing? Bacon Congregate came into existence in 1984. An old factory in a Hartford, Connecticut neighborhood was renovated to create congregate housing for the poor and elderly. Funded in a complex arrangement of monies from Title XIX of the Medicare Bill and the State of Connecticut, the planners saw an opportunity. For every two rooms, there would be one kitchen. Bacon Congregate was ahead of the curve. The bureaucrats realized that by providing subsidized congregate housing (meals, housekeeping, 24 hour security) they could save money, since residents would not be in nursing homes. The state of Connecticut subsidizes the rentals for the 26 residents in the building. Each resident signs a lease and pays an affordable rent based on income. Executive director Trish Beatty calls Bacon Congregate a “best-kept secret.” But first they had to fix the kitchen problem. 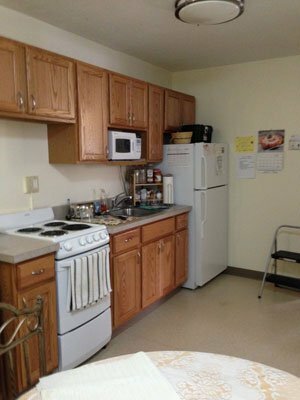 They lived with it for fifteen years until HUD agreed to reduce the number of residents in the building, allowing each resident to have their own private kitchen. The physical layout contributed to the conflicts. In order for residents to get to their own rooms they had to walk through the kitchen. The kitchens were on the inside of the building and were long, narrow and window-less. What happens when one person is cooking and another is coming home? They are forced to interact or to ignore each other. Ugh. It also means that the other person would always know if you were home or not. It’s an invasion of privacy. Few adults would find that comfortable. Then there’s the question of compatibility in kitchen use— how clean the kitchen is, how one uses the kitchen, and what kind of foods are cooked in it. Dirty dishes? Leftover food in the fridge? One particularly bad pairing were two women, one of Indian descent and one Latina who shared a kitchen. Imagine how it would be if you didn’t like Indian food and the smells were part of your home environment. Another conflict was a younger person who came in late and cooked in the kitchen late, disturbing the other older person who went to bed early. The residents didn’t get to choose their kitchen-mate. They were assigned and it was expected to work out. It is so extraordinarily rare that this works. The one case where it did work was when siblings shared a kitchen. First and foremost, all adults want to have choice in how they live and with whom they live. There is an astonishing difference between being told what to do and choosing what to do. When you are going to be sharing a home, it is essential to have a thorough conversation about kitchen use and routines before agreeing to live together. Different habits and preferences can become a source of conflict. And that conflict can break a relationship, causing one person to leave. When they can’t leave it becomes hell. The Compatibility Assessment is designed to help potential home-mates have this conversation about kitchen use and other key elements of living together. The conversation clarifies personal preferences and habits. If there’s enough compatibility, the conversation also leads to making agreements about how to share a home. If in the conversation you don’t have clarity and agreement, you shouldn’t live together. When you do have clarity and agreement, it is far easier to share. At Bacon Congregate residents now have their own kitchen. In the common room where they have a hot meal at lunch time there is a feeling of contentment, safety and community. There is laughter. GReat article. You really go the extra miles to know the “turf of your topic”. Absolutely true! I share the home I own with up to 7 other adults of all ages, 5 of whom share one kitchen that I use some of the time too. The number one complaint I have heard from housemates over 9 years is about dishes left by others in the sink. Not noise. Not personality. Dirty dishes. It used to delight me to see evidence of other people using the kitchen – I felt less alone. The charm wore off.